Daighre is a Breton miner living in Left Hand Mine, just outside Markarth. She is the mother of Erith. Daighre wears a set of miner's clothes and a pair of boots. 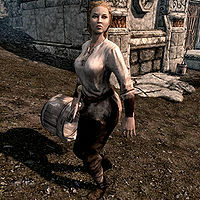 Like most miners, she is equipped with a pickaxe, and carries a key to her house, as well as a selection of common items and gold. She seems to believe that she is better than most men and she will soon tell you that "I'm the hardest worker in Left Hand. Better than any man." She also seems to love her daughter quite a lot and she will also remark, "Most women would rather die than dig, but I have a daughter to raise." It also seems that her husband died many years ago. The only reference that she makes to this is "My Erith has her father's eyes. She's all I have left of him." 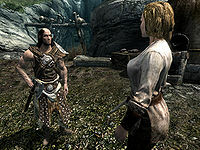 When the Forsworn attack her friends she will feel very sorry for them and remark, "Poor Pavo and Gat. To have lived through a Forsworn attack." She will also tell you, "Another day, another settlement gets attacked. No place in the Reach is safe from the Forsworn." Erith: "Mama, can we talk. You know, about papa?" Daighre: "Of course, sweetie. What'd you like to know?" Erith: "I don't know. What'd he look like?" Daighre: "He had your soft face, and that silly grin you get when you've done something wrong. That's his, too." This page was last modified on 23 November 2013, at 07:51.